Just like the wait for the new Game of Thrones series, this article is going to be a long one. However, all waiting comes to an end and although the freezing period is over for the most of us… For the fans of the popular TV show: The Winter Is Coming! 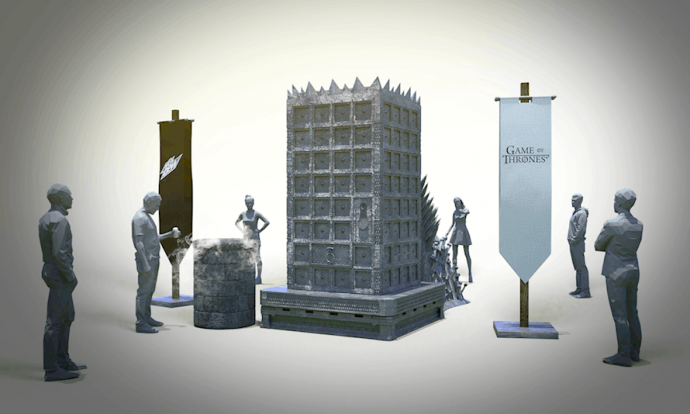 As HBO‘s hit fantasy series Game of Thrones returns for its eighth and final season this weekend on April 14, we would like to show you all the magnificent work the network has delivered in the past month in the quest For the Iron Throne. Every year, there’s an excessive planning process for marketing partnerships for the series’ season which began back in the summer of 2017—right after the end of the 7th season—and is now nearing an estimated “$20 million marketing blitz”, according to the Wall Street Journal. 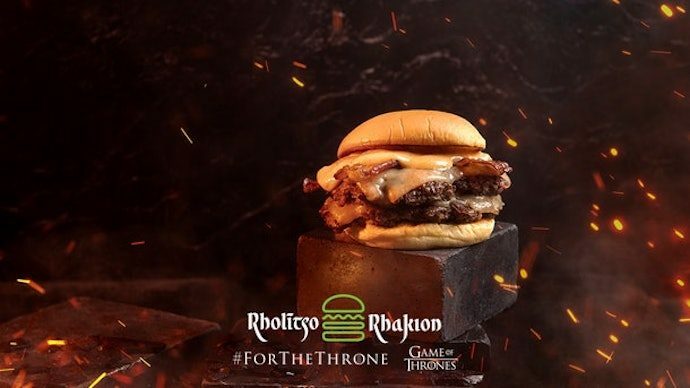 This year, the collaborations span from Bud Light, whose Super Bowl ad uncovered the sad fate of the “Bud Knight”, who paid the ultimate price when faced against infamous strongman The Mountain, to Shake Shack – which has a “secret” Game of Thrones menu that hides a fiery burger and shake that can only be purchased if the customer orders them in a language spoken in Valyria at the Madison Square Park location. And wait, there’s more! But first, in order to quench the fans’ thirst for the upcoming season (and not just after eating a spicy Dracarys Burger), there are even limited-run special-edition Mountain Dew cans with a special hidden message. 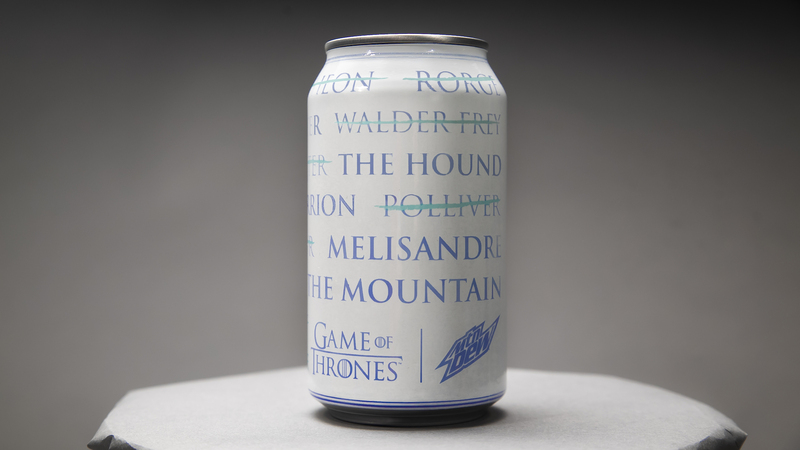 The can design is inspired by one of the shows most adored characters, Arya Stark, and her deadly training with the Faceless Men of Braavos, during which she has to give up her identity and become a “no one”. When warm, “A Can Has No Name” shows no signs of danger as it’s plain white and ‘brandless’. However, the moment it gets cold, it reveals the names on Arya Stark’s kill list—as a tribute to the show’s characters who met their demise through the little girl’s hand, plus her remaining targets. To get their hands on the cool no-name cans, consumers could choose to get it either online—by using hashtags #ACanHasNoName, #ForTheThrone and #MTNDEWsweepstakes to tell the soft-drink brand what they would sacrifice in order to have one of the special cans sent to them—or go on a scavenger hunt in real life. GoT fans in New York and LA could snap up the rare collection item by following clues on Mountain Dew’s social channels and then giving a secret password to the “Masters of Coin” who would lead them to a unique “Ice Vending Machines” that served the cans. The chilling teaser comes as a part of the “For the Throne” campaign, which sees the network teaming up with creative agency Droga5. The partnership also includes a social-good event carried out by the American Red Cross. As the show’s main protagonists—Arya, Cersei, Jon, and Tyrion—have all bled for the throne, HBO and the Red Cross forged an alliance that challenges fans and donors to show their bravery and valour by asking them “Will you bleed for the throne?”. 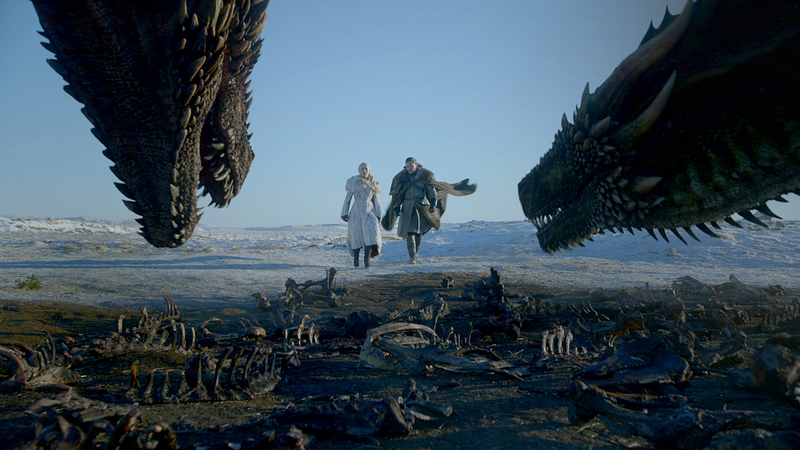 “We are incredibly excited to mobilize the global army of Game of Thrones fans to make a positive impact on the world,” said Zach Enterlin, EVP of program marketing at HBO, in a statement. “In partnership with the American Red Cross, we’re creating a unique platform to engage our tremendously passionate fanbase, and ultimately showcase the bravery and valor of those fans who will go so far as to bleed for the throne,” he adds. “Every day, thousands of patients across the country are dependent on voluntary blood donors to help them fight for their lives,” said Cliff Numark, SVP at American Red Cross Blood Services, in a statement. “Winter is finally here, and the needs are dire. No matter [whom] you’re rooting for to take the throne, you can be a hero for patients in need,” he concludes. So, even if you missed the event, you can still schedule your blood or platelet donation today and help a good cause! Now, as you might have expected, let’s focus on the main course. The Throne. Well, actually the six of them. #ForTheThrone main event included a worldwide hunt for six life-sized Iron Thrones that were hidden in various international locations! The first one was hidden in what appears to be a forest. And the clues to find it? HBO posted just a few 360-degree YouTube videos of the ‘Throne of the Forest’ with a countdown timer showing how long fans had left to successfully claim it before time has run out. Just watch the video below and try to figure out the location of the first throne. If you can’t, don’t worry, we already have a winner! So, after encouraging the fans to “bleed,” “create” and “quest” for the throne, it was only a matter of time before the quest moved on to the second throne. The second life-sized throne, titled “Throne of the North”, was stored far away in a northern icy tundra of Björkliden, Sweden, and a pair of friends have successfully claimed their prize. After the second throne was found, HBO went on and prepared two more at the same time in order to make it for the premiere of the new season. The third and fourth pointy seats were both indeed successfully located. The “Throne of Joy” can be seen stacked away on a hill while a castle can be seen in the background. The location seems to be the exact same spot where episode three of season six was shot. Yes, this is where a young Ned Stark was trying to protect his younger sister, Lyanna Stark. So, the new throne was located at the Castillo de Atienza, north of the Spanish capital, Madrid, while the “Throne of Valyria” was placed in a rocky canyon somewhere in Brazil. Even these general locations didn’t stop the fans to hunt them down. Now, let’s move to the fifth Iron Throne, titled the Throne of Ice, which was cleverly concealed in Tumbler Ridge, British Columbia, Canada. The life-sized high-chair was discovered by a couple, Kevin and Birgit Sharman. The pair were greeted by two men dressed in fur-lined robes upon being the first to discover this throne hidden in North America. Just watch their excitement in the pictures below. The final Iron Throne hidden was found in Queens, one of the five boroughs of New York City, during last week’s Thursday. The winner, Melanie Joaquín, said she instantly recognised where the throne was hidden when HBO posted the clue to its social media accounts. And according to Hypebeast, 10 minutes later she was on a bus to the battery at Fort Totten Park in Queens. After discovering the throne, a man dressed in a fur-lined robe crowned her with the Baratheon’s crown. Check out the video above of the last Iron Throne being unveiled among the Queen of Queens. Still, the massive campaign—all worthy of the final season of one of the most popular shows on earth—isn’t over. There is one piece de resistance left. It’s black. It’s white. It’s sweet. And it’s round. 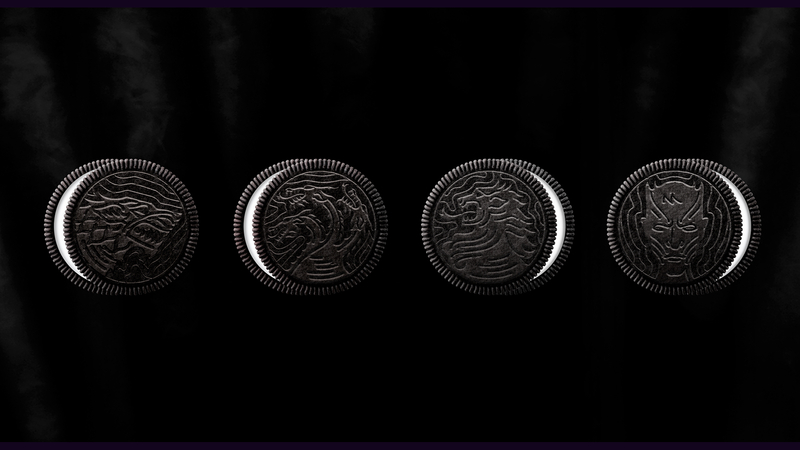 Yes, we’re talking about the popular cookie purveyor Oreo. For the Throne, the brand launched a new line of its “chocolate sandwich cookies,” which are inspired by popular houses of the hit fantasy series, and, also, the Night King. Perhaps to represent the white icing?